This biography is presented as a "Biographical Timeline" and does not delve into each and every aspect of John Wayne's life. There are far too many great full-length biographies available, and far too much information to be presented here. This biographical timeline will look at those important milestones in John Wayne's life which helped to define his life and his career as one of the most popular actors in American cinematic history. Special attention will be shown to that period of his life between his initial introduction to film and his "overnight" success with 1939's Stagecoach. There has been much speculation as to just what film's he worked on and appeared in during this time frame, and hopefully this biography will help to answer some of the questions that have been born of that speculation. To view the John Wayne Filmography, Videography, Discography, Radio Appearances, Television Appearances, and "In Print" lists, use the drop down tabs under the "Biography" tab above. 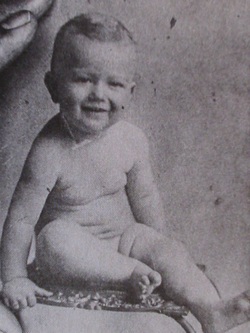 On 26 May 1907, John Wayne was born as Marion Robert Morrison, the son of Clyde Leonard Morrison and Mary “Molly” Alberta Brown, in a small white frame house located at 216 2nd Street in Winterset, Iowa. Within three years, the Morrison’s moved to Earlham, Iowa, and in 1912, Molly gave birth to a second son, naming him Robert and changing young Marion’s middle name to Michael. The name change was not a legal name change, but Marion, ever the obedient son kept his new middle name. By 1914, Clyde had developed tuberculosis, and move to Palmdale, California where he had purchased 80 acres of land, sending for his family once a house had been built. Clyde’s farm failed, and in 1916, the family moved to Glendale. It was while the family was living in Glendale, that young Marion acquired the nickname “Duke,” being given the name by some local fireman. 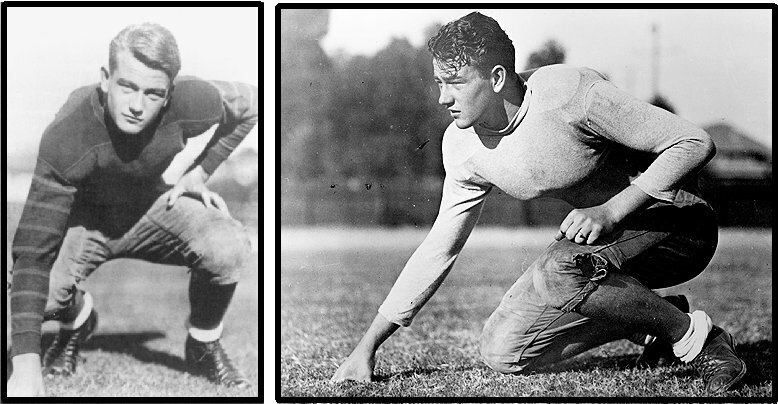 Duke entered Glendale Union High School in 1921 where he excelled both academically and on the football field. 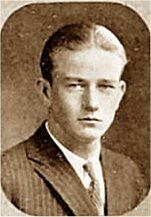 Duke entered his senior year of high school in the fall of 1924. During this final year of high school, the varsity football team made all-state, and Duke played guard. He was the president of the school’s Letterman Club, a member of the school debate team, head of the Latin Society and the Senior Class President. He was an “A” student with a 96 average. Duke’s prowess on the football field was noticed by recruiting scouts from the University of Southern California (USC), and he was offered a football scholarship to USC. Initially, Duke was unsure if he wanted to attend the university, as his heart was set on an appointment to the Naval Academy at Annapolis. As fate would have it, however, in spite of his high test scores (ranking number 2), he did not receive the appointment, and it was off to USC in September 1925, where he enrolled in pre-law classes and joined the prestigious Sigma Chi fraternity. Although the year 1925 should have been full of hope and promise as Duke began his collegiate career, it did hold a dark spot for him as his parents divorced. Clyde and Molly’s marriage had been on the rocks for several years, and quite often Duke found himself at odds with his parents. Feeling hurt by their divorce, Duke distanced himself from both parents, and rather than going home during the summer break from school, he asked his football coach (the renowned Howard Jones) to help him find a summer job. Jones sent Duke and a fellow football player to the William Fox Studio to work with none other than Tom Mix. June 1926: School let out for the summer break, and Duke headed over to the Fox lot, seeking film star Tom Mix. Mix promised Duke that he would hire him for $35 per week to be his personal trainer as soon as he returned from location shooting on his current film. In the meantime, Duke would work as a property assistant on the lot. Although he was working on the Fox lot, he also found his way over to the MGM lot, where he met actor Iron Eyes Cody in 1926. Cody remembered that Duke took some screen tests, but that he did not pass muster. He may not have succeeded in landing a contract with MGM, but he did appear in at least two MGM features during 1926, Brown of Harvard (his first appearance on film) and Bardeleys the Magnificent. In both films, Duke appeared as an uncredited extra. In between these two films, Duke worked as a prop boy and uncredited extra in the Tom Mix film, The Great K&A Train Robbery, filmed on location and on the Fox lot. Since Brown of Harvard was released on 2 May 1926, and Duke’s summer break did not begin until the following month, it is probably safe to say that his participation in this film occurred during the school year, and likely featured several of the USC players in addition to Duke. In fact, as Duke was an uncredited football player in Brown of Harvard, it is also likely that his “scenes” were filmed during USC football practice games, and then used as part of the film. 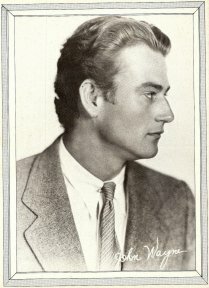 Duke’s brief appearance in Bardeley’s the Magnificent (which was produced during roughly the same time period as Brown), could easily have been done at either the same time he was working on Brown, or after school. It is difficult to say. It was also during 1926, that Duke first met John Ford, probably while Duke was working on The Great K&A Train Robbery. Although he had yet to work with Ford, the director must have seen the potential in Duke, and sent him to see his good friend Lloyd “Ham” Hamilton for work. Ford had already asked to Hamilton to cast in any films he was doing where there might be room for an extra. This would not only give Duke some more experience in front of the camera, but would also allow Ford to solicit any observances Hamilton might make regarding Duke’s potential ability as an actor. The summer of 1926 was not all work and no play for Duke, however. He was slated to start with the USC Varsity team in the fall, and as most young men his age, he was interested in girls and in having fun. It was during 1926 that Duke began dating Carmen Saenz, daughter of the Consul General of Panama. It wasn’t long, however, before he fell in love with her sister, Josephine. 1926 was not all fun and happiness though. During a trip to Balboa Beach to engage in one of his favorite pastimes, body surfing, Duke was involved in an accident and severely damaged his right shoulder. The injury hindered his football playing, and he was relegated to the second string. When continued football practice over the summer, he further exacerbated the injury. With his severe shoulder injury preventing him playing football or doing much else that involved any strenuous activity with it, Duke eventually lost his football scholarship. He finished out the school year, and then, unable to afford his tuition, he was forced to leave USC. In May, the film Annie Laurie, which Duke had worked on during the summer of 1926, was released. As in the other films he had appeared in, he was again an uncredited extra. His relationship with Josephine (“Josie”) was experiencing trouble due to her parents strict adherence to their Catholic beliefs (Duke was a Protestant, and her parents disapproved of the relationship), he had lost his scholarship, and his grades were suffering due to the immense stress he was under as a result of these troubles. In May 1927, Duke decided to leave it all behind him, and he stowed away on a steamer bound for the Hawaiian Islands. Whether it was just bad luck, or the hand of fate we may never know, but he was discovered, and returned to California in June of 1927. Duke then sought out John Ford, and asked him for a job. Duke worked on at least 3 different film projects in 1927, The Drop Kick (released in Sept. 1927), Mother Machree (which had initially began production in Sept. 1926), and an untold number of Ham Hamilton comedy shorts (courtesy of his mentor John Ford). [note: it is possible that Mother Machree was in post production at this point, and Wayne may not have worked on that aspect of the film. It is known though, that at some point he did work on Mother Machree.) The Drop Kick holds the distinction of being the first film in which a very young John Wayne can be seen on film. He was an uncredited extra cheering in the stands during a football game.